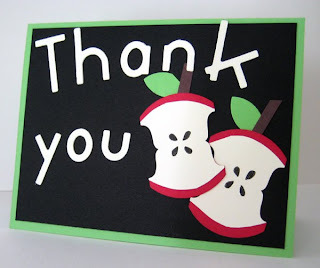 Here is another version of this thank you card modified so that it doesn't use the Big Shot and alphabet dies. I liked the "school look" the Spiral punch created. 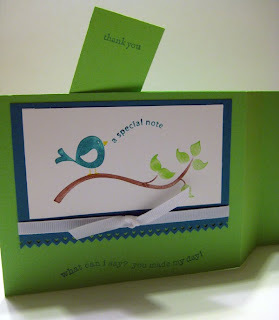 This card goes together quicker too since the thank you is a stamp instead of individually glued letters. It looks a little off in the photo, but everything is straight except the black piece. Many of you know I don't do "jaunty" often. 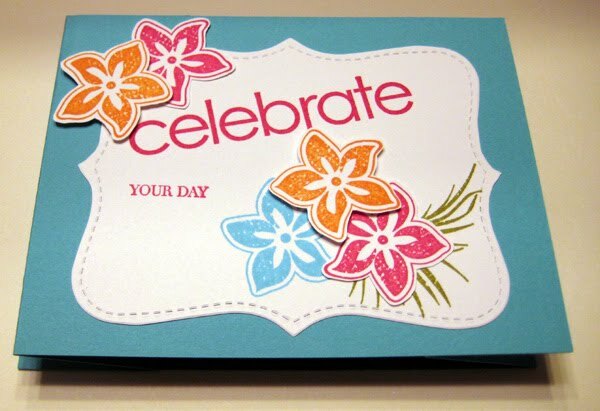 Here's a cross between this windshield wiper card and this celebrate card. Both were projects for stamp club this month, and I liked this fold so much that I decided to use it as my APEX swap (A Positive Example). My upline, Meg, hosts this event for demonstrators in all levels of her downline who meet certain qualifications. It is something I always hope to qualify for and the great thing is demos from all over participate since we have a by mail option. 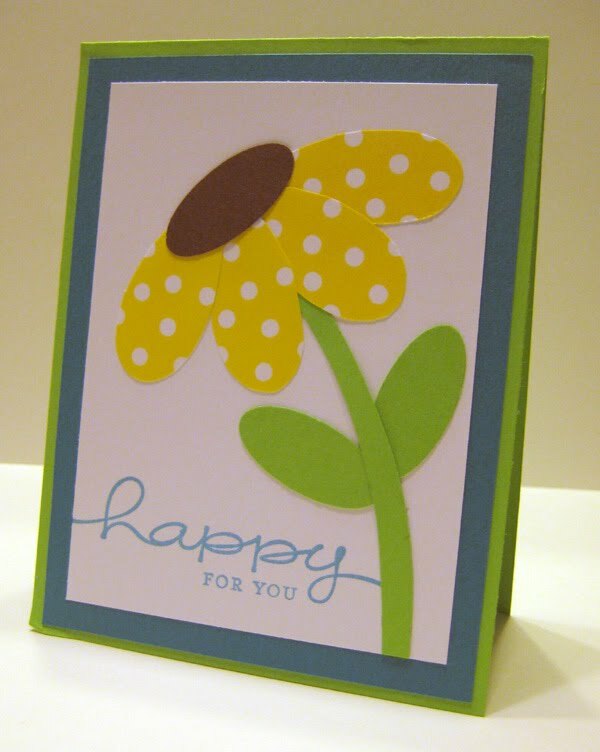 The projects the other stampers make are always terrific, and I am looking forward to receiving my package in the mail soon! On Saturday, Deana planned an awesome make-n-take for us. I knew we were in for a paper treat of some kind when there were "supplies" at each spot at the table. She figured out the dimensions to make a cute little cupcake, and then we got to make our own. This is one of the projects I worked on yesterday while stamping with friends (thanks Deana for the invite!). 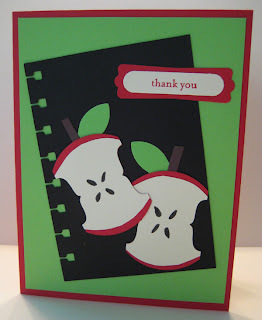 I have seen several cards and projects made with punch art apples but had never made a card using one. They are super easy to do and make a perfect card for the end of the school year. 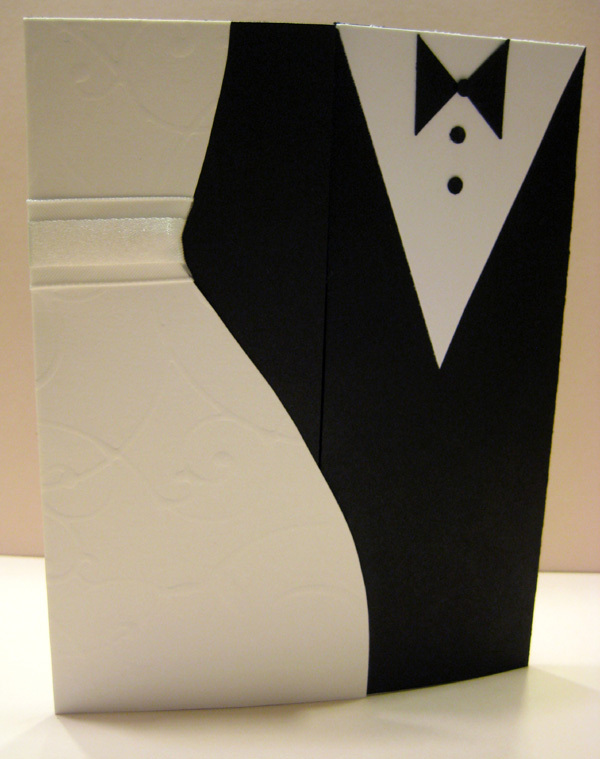 This Flip Card is kind of difficult to showcase in a photo, but it is a great way to create a fancy fold using your Big Shot. 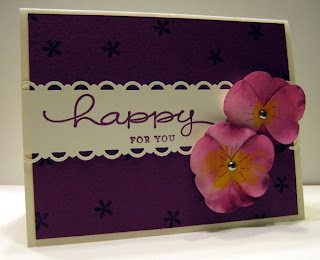 My friend, Rae Anne, has a great tutorial on making this fancy fold. I had to order the scallop circle after seeing what she did with it on my birthday card! Don't you just "hate" it when that happens? One of my club members called the narrow top piece a handle, which seems about right. It is all in the way you line things up. It's easy to create a different half cut by changing the way you run it through your machine. Sometimes that happens even when you aren't trying too :-) We then ran it back through the Big Shot with the new Square Lattice Impressions Embossing Folder from the Summer Mini Catalog to create the textured back side and stamped a Top Note piece to finish it off. 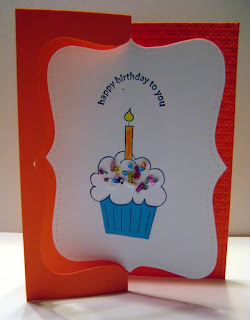 We used cardstock to make the cupcake paper, but colored the candle with Water Color Crayons. The sprinkles are non-Stampin' Up! and held on with Multi Purpose Adhesive. This fantastic technique was demonstrated by my friend and upline, Shirley, at a recent meeting. I knew when I saw it that it would be a stamp club project! Her directions came from Dawn's blog. It uses the butterfly punch, a spray bottle of water, reinkers, and an Aqua Painter. Punch the butterflies from Shimmery White cardstock, spray them with water, dab the edges of the butterfly with reinker and watch the color spread. I used Rich Razzleberry and Crushed Curry reinkers, and like anything, the more color you use, the darker the pansies turn out. Here's another stamp club project we did last week. 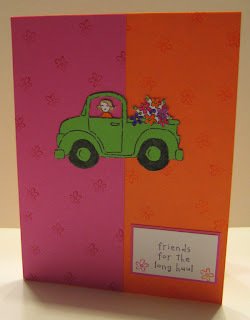 I used two retiring colors and liked them so well I used that combination for a stamp-a-stack card too. The colors are Taken with Teal and Green Galore, and if you want some of your own, the supplies are dwindling in certain colors. They won't all be available through the end of May as we expected. Click here to order these or any other retiring colors. When you pull the card on each side, the little flag piece comes up like a windshield wiper! You just stick the flag down in one corner and it will fold up and down with the card. When I was pulling out some Shimmery White cardstock for a stamp club project this week, I came across the template I used for a wedding card last spring. I think it could be one of my all time favorites. I just cut the triangles free-hand, and the dress is Shimmery White cardstock with clear embossing. I used a retired set To Have and To Hold for the embossed images on the gown. On the inside, I used another piece of Shimmery White with silver and black ink. I am really happy with how this card turned out. But there was one nervous moment when I changed my mind on the greeting. Everything was finished and stuck down which meant there was one chance to get that "Celebrate" word to go through the middle with out grazing a flower. 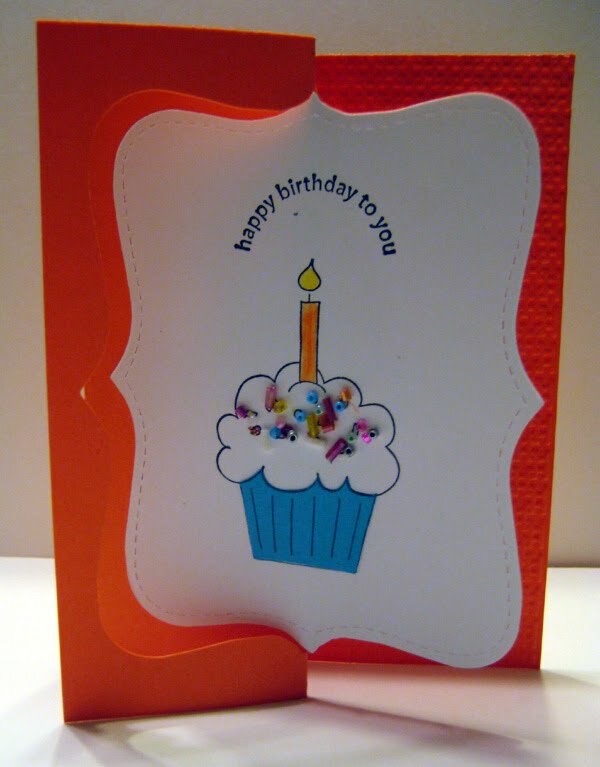 Haven't all stampers been there before - making a change to the card at the last minute causing us to have to do it the hard way? 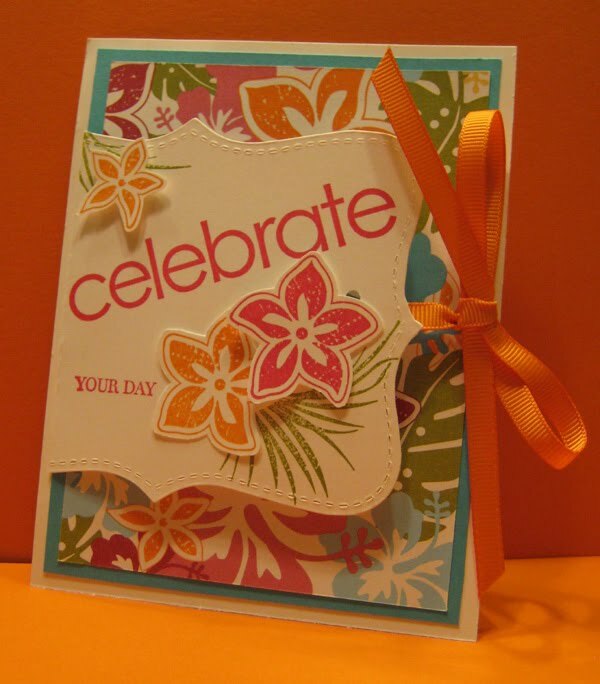 I used the new Island Oasis Designer Series Paper and the new Tropical Party stamp set from the summer mini catalog. I have a feeling you will be seeing a lot from me with this set, and stamp club members will be making this card tonight! This was our final Stamp-a-Stack card for this month. I try to do one wedding card each spring for those people attending weddings during the summer. 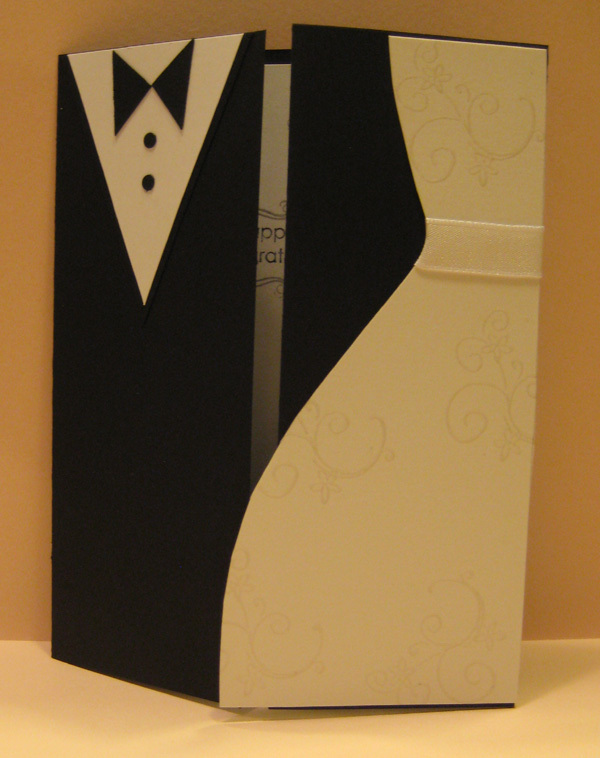 But even if you don't have 3 weddings on your calendar, it is always nice to have one in your file. 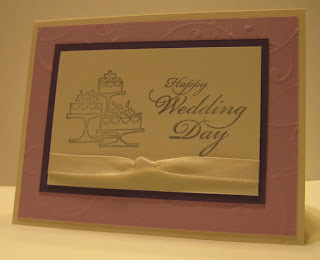 This card uses Very Vanilla cardstock and ribbon, but I think the embossed Pale Plum adds a simple elegance to this card. 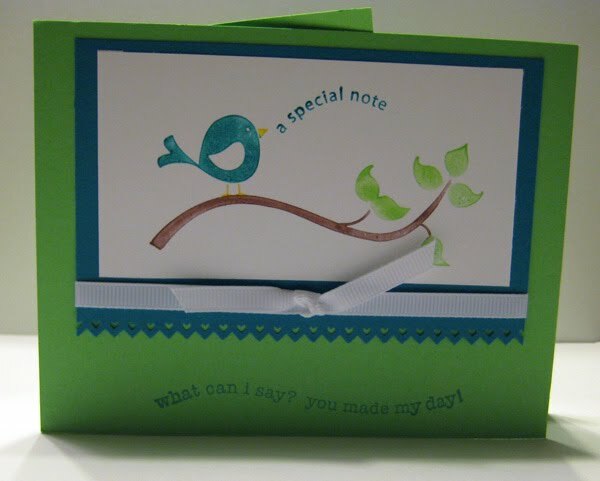 Here is another one of our stamp-a-stack cards for this weekend. It uses the Pick a Petal set, the small oval punch and a little freehand cutting. I liked the idea of cutting the flower petals out which then eliminated the need for worrying about perfect placement when I stamped. The Happy Everything set is a good one for a Stamp-a-Stack because everyone can do their own thing with the greeting. 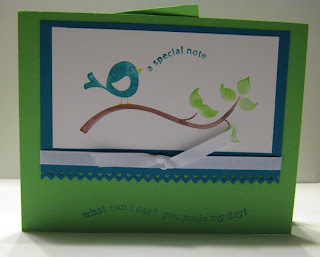 Here is a sneak peek at one of our stamp-a-stack cards for this weekend. 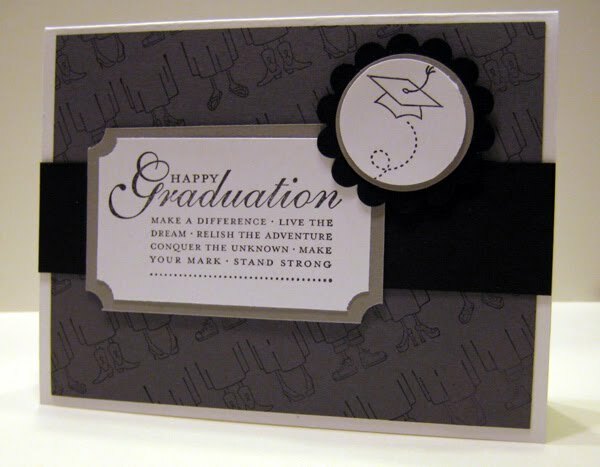 This one with the gray is an all purpose card for any graduate. I also did one with my school's colors for fun. 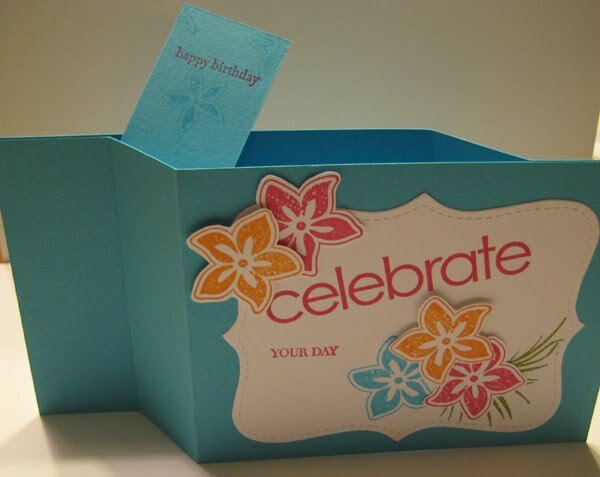 If you have specific colors, we can customize yours a bit on Friday/Saturday if you would like. No graduates this year? Then the gray will be perfect and you won't have to run out some year in the futue and buy a card! This card uses the set Go, Graduate and also the a la carte single stamp Happy Grad from the brand new mini catalog. I just couldn't decide so I ordered them both! The clear block made it easy to stamp the rows of feet without a lot of trouble placing them. 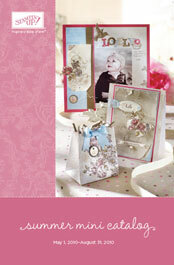 The Summer Mini Catalog is here with some great new products May 1 - August 31. If you are local and didn't get one in the mail, let me know and I will drop one by your house. For you long-distance readers, I will be happy to put one in the mail for you. 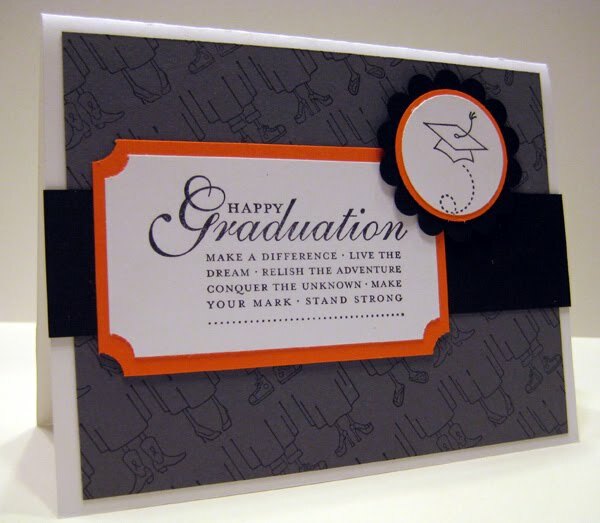 Join us this Friday for the May stamp-a-stack and use the graduation sets from the mini (watch for a sneak peek this week). 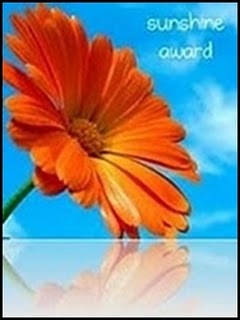 What a nice surprise it was when Pam Browne nominated me for this blog award! I need to pass along the sunshine and nominate some of my own favorite blogs. It's going to take me a little while to narrow it down and find some stampers who haven't been nominated by someone already. So give me a little time :-) But I wanted to thank Pam for this award - you made my day!